Industrial router Bivias v2 is equipped with two independent communication modules for wireless connectivity of various equipments and devices via Ethernet interface 10/100 to the internet or intranet. Each module can and should use the infrastructure of another cellular service provider. 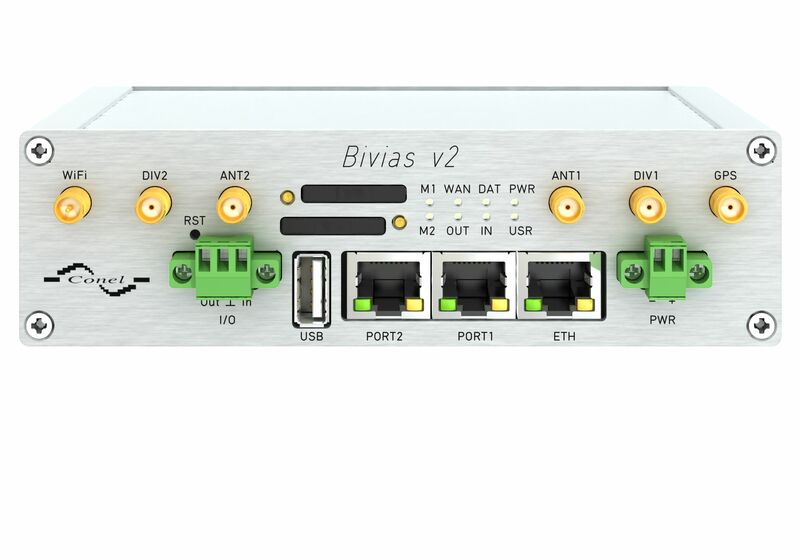 This router allows customer to combine modules for different mobile technologies – HSPA+ technology on both module positions. Due to high download and upload speed is this device an ideal wireless solution for traffic and security camera systems, individual computers, LAN networks, automatic teller machines (ATM) and other self-service terminals and machines. 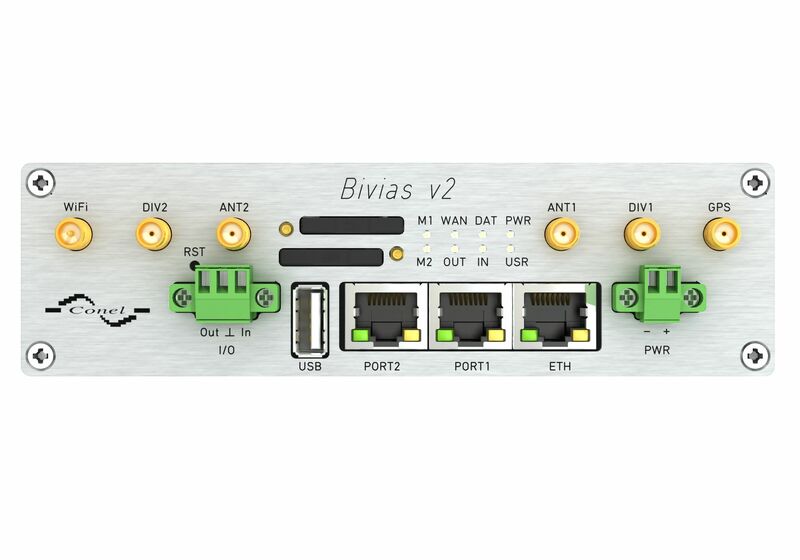 As a standard, Bivias v2 router is equipped with one Ethernet 10/100, one USB Host port, one binary Input/output (I/O) port and two SIM cards. The wide range of interface options of this router further expands an expansion ports designated as PORT1 and PORT2 which are mounted on the customer’s request. For PORT1 are available: Ethernet port 10/100, seriál interface ports RS232, RS485, RS422, MBUS or inputs/outputs (I/O – CNT). 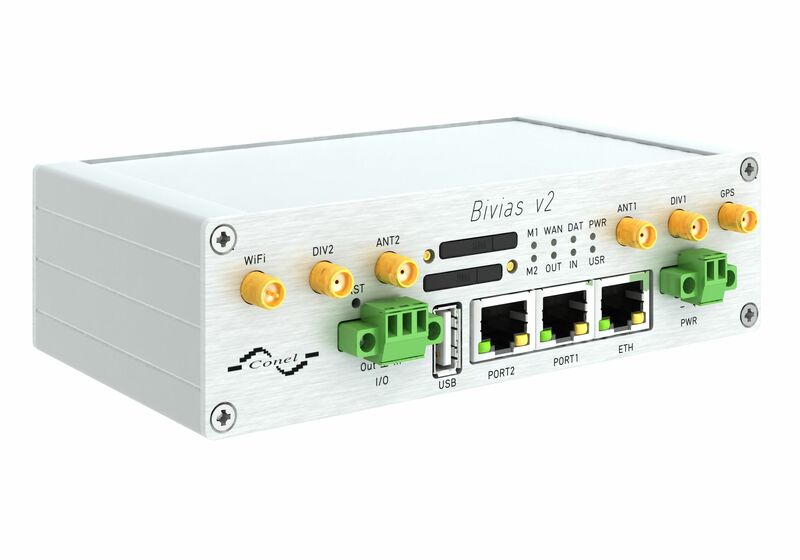 PORT2 may be equipped with serial interfaces RS232, RS485, RS422, MBUS, wireless interfaces WIFI or WMBUS, SDH expansion port or inputs/outputs (I/O – CNT). Both of ports can be fitted with internal switch (exp. port SWITCH). This wireless router is supplied in a metal casing.